Mexico – it’s a warm, vibrant country that attracts millions of tourists worldwide. It also attracts visitors needing more than what a one-week vacation can provide. 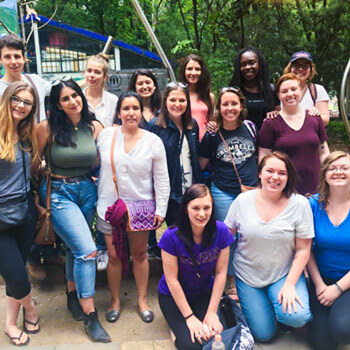 Each year, thousands of Central American migrants look to Mexico for a different kind of haven – a safe haven – as a group of students in Laurier’s Human Rights and Human Diversity program witnessed first-hand during their spring 2017 field course experience. Migrants, like those Williams and her classmates met, are fleeing circumstances of ethnic targeting, criminal gang violence, sexual discrimination, environmental degradation, and poverty. Wilson-Forsberg, who offers the field course every two years in partnership with colleagues at the Instituto Tecnológico y de Estudios Superiores de Monterrey (ITESM), says the experiential learning course sheds light on an extremely dark reality. Wilson-Forsberg, who has studied and worked in Mexico, specializes in immigration and multiculturalism. The classroom component of Wilson-Forsberg’s course was held at ITESM’s Mexico City campus where she and Mexican colleague Diana Correa lectured about Mexico’s socio-political history, migration theory, human trafficking and unaccompanied minors. Guest lecturers from the United Nations High Commission for Refugees, human rights lawyers and activists also contributed frontline experiences with Mexico’s migrant population to the classroom. Wilson-Forsberg and her students visited several non-governmental organizations and migrant shelters, solidifying the theories, experiences and practices that permeate Mexico’s migrant communities. While at the Estancia del Migrante González Martinez, a small, family-run refuge in Tequisquiapan, Querétaro, the group met a man looking for food and a place to sleep. He was walking to Mexico City, recently deported after living in the United States for 18 years. He had nothing more than the clothes he was wearing. “Rather than just reading about what’s happening in Mexico, I’m seeing it with my own eyes,” says Williams. Migrants riding the infamous freight train “La Bestia” (the Beast), further exemplify the page-to-reality learning experiences for students like Williams. The train, which runs north to south from the Mexican-Guatemala border to the United States and back, can be seen with hundreds of migrants riding atop old boxcars, ideally destined for a better life in the north. But that’s not guaranteed. Neither is their safety – or survival – while en route. Williams and three others observed a passing train – a lucky occurrence as trains run irregularly to avoid being robbed. Armed officials, resembling military personnel rather than security guards, rode alongside three migrants. Williams assumed the migrants were able to bribe the security guards to allow them passage on the train. Those unable to pay the bribes are thrown from the train, subject to human traffickers, gangs or death. Wilson-Forsberg says just as many riders heading north end up returning south after being deported from the United States. For Williams, the course also sheds new light on the Mexican people and some of the stereotypes attached to them. A course that balances inspiration with heartbreak, Wilson-Forsberg says the silver lining of the Mexico Migration and Human Rights course is seeing the “incredible warmth of the Mexican people” through the eyes of her students. Laurier offers a variety of domestic and international field courses with opportunities to learn while in the Northwest Territories, France, Spain, Greece, China and Uganda. Read more about learning beyond Laurier’s campuses.